Take a gander at these golden crispy brown rice tortilla chips. I managed to eat the whole bowl, still slightly warm from the skillet. Are you a salty crunchy snack person, or a sweet and creamy snack person? It's an easy question for me. I can answer it in my sleep. While dancing backwards blindfolded one hand tied behind my back (don't try this at home). Or even while insanely preoccupied attempting to balance my checkbook. I never balance my checkbook. I haven't in twenty years (does that count as never, or only mostly never?). Math and me? A match not made in heaven. I wrestle with math like Chuck Liddell vs a small furry creature. I am the creature- let's say, for instance, um, a small shivering bunny. Math is the Ice Man. It's more of a surrender than a smack down. I don't have the chops. Maybe it's because I used to draw in my fifth grade math class instead of listening to Mr. Martone (he summoned my mother to school at least twice to convey how serious a matter it was that this inattentive ten year old girl was not only refusing to focus on x = y in his tedious class, she was drawing pictures all over her math work sheets). My checkbook balancing gifted mother (on several occasions) tried to lure me into her ordered world of numbers by telling me how much she "loved math" because "1 + 1 is always 2". When I would hear this (and the last time I heard this I was an adult with children of my own) I would sincerely think, It does? Not always. It can't always be 2. Sometimes it's 11. And my mind would be off wandering in a series of images (perhaps including bunnies of various size) never to return to the column of debit vs balance. In my hard won wisdom years later I understand that not everyone encounters the world in the same way. Even though we share the commonality of our five senses, we do not see green in exactly the same shade, hear the exact same B flat, taste cilantro identically, or smell a rose as identical twins (roses smell like a musty basement to me- am I alone in this?). The sensation of touch is also highly individual. I confess I cut out each and every clothing tag lest it drive me completely, totally, remarkably insane (and who invented clothing tags, anyway? And why? Are they a special brand of torture devised to keep us Princess and the Pea types chronically distracted and itchy?). What's up with THAT, I ask you? But back to numbers. They may make perfect sense to you- and that's lovely (and lucky) for you, Dear Reader. I suppose. You'll sport a balanced checkbook. And multiply without using your fingers. But for those of us with brains that cannot decipher the mysterious foreign language of numbers, I am here to mention (in a post about tortilla chips) that we may, you know, have other gifts. We may have different neural pathways that fire and spark toward visualization, intuitive problem solving and imagistic, associative word play. So don't feel sorry for us when we don't believe that 1 + 1 is always 2. We're fine with it. And we know how to make the color green from ivory black. The trick in this life? Finding someone who values that very particular shade of green. As you may have guessed by now, my vote for favorite snacks is crunchy salty. And I love a good corn chip. 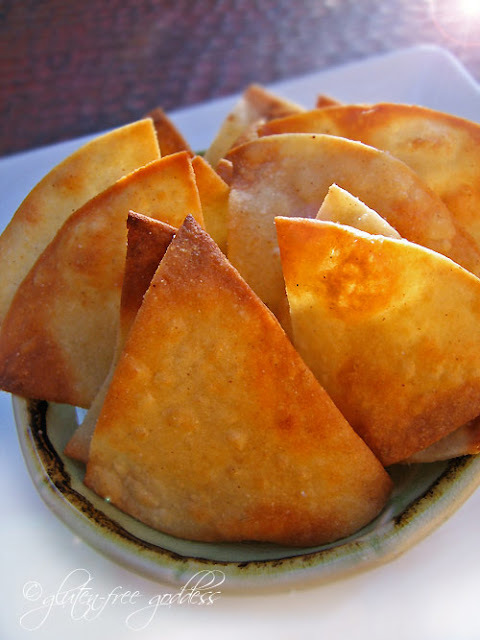 But lately I've been frying up my stale brown rice tortillas into snappy triangles of crispy goodness. This is not really a recipe- hence my meanderings about math and brains and neurodiversity. But here's what I do to make these golden beauties. 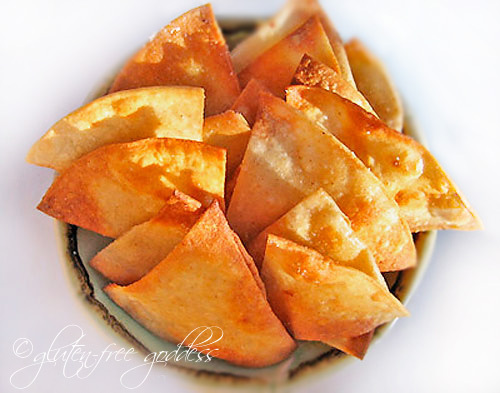 Corn-free chips that are just as good- if not better- than your tried and true tortilla chips. Using a pizza cutter, slice the round tortillas into triangles. Pour about a half inch of extra light olive oil into a deep sided skillet (I used my big heavy iron skillet). Heat it over medium heat. It should not be smoking. When the oil is hot, drop in as many triangles as you can loosely fit into the skillet. Lay out some paper towels for draining. Using tongs to turn over the chips, fry on both sides until they are golden and crisp (they will crisp up more as they cool). This takes, maybe 4-5 minutes- don't ask me, I'm no good at math. Using tongs, lift the chips out of the oil and drain on paper towels. Salt lightly on both sides while they're still hot. Continue with the remaining triangles- until you're done frying them all. If you need to add oil, add a little at a time. As they cool they get crispy crunchy. Please make sure the tortillas you choose are indeed gluten-free. Wheat-free may not be gluten-free. Check on-line for a brand you can trust. Apparently, a recent (December 2011) test of Food For Life brown rice tortillas (and their millet bread) to contain above 20 PPM gluten; see alert here at Gluten-Free Watchdog. We love our tortilla chips with salsa (well, duh). But they're equally tasty with hummus and guacamole. Check out my dip recipes here. 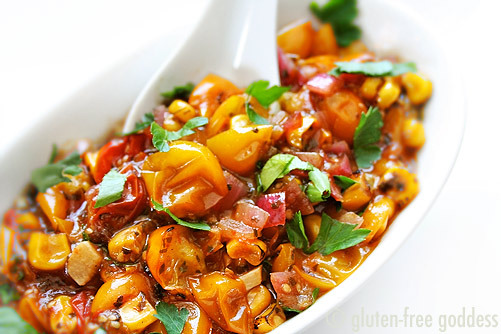 Try my Roasted Yellow Tomato Salsa- it's perfect for a party.